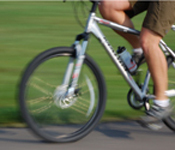 If you’re a bicyclist, you know safety’s first. Knowing the rules of the road and riding defensively are the best ways to protect yourself from harm. But you must also think finances in case of personal injury. Between lost wages and medical costs, the bills can add up fast. Even if a motorist’s involved, their car insurance may not cover all your expenses. These coverages are affordable. In fact, you can access up to $100,000 of Medical Payments coverage for just $71! Read on as Boston personal injury lawyer David White shares his advice to cyclists for keeping safe and protecting their wallets. Tagged: "bicycle safety", "Boston personal injury lawyer", "car insurance for bicyclists" and "personal injury"